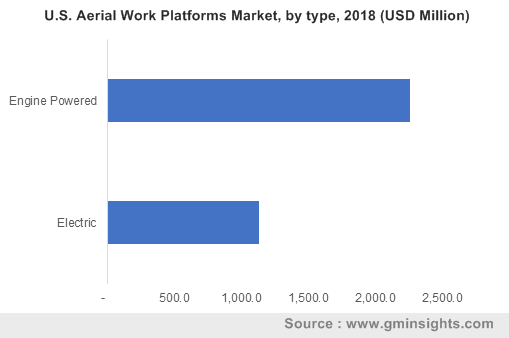 (AWP) Aerial Work Platforms Market size was valued at USD 9 billion in 2018 and will grow at a CAGR of 9% from 2019 to 2025. The global shipments are expected to reach over 190 thousand units by 2025. Rising urban & rural infrastructure transformation projects to address the increasing population requirement across the globe is creating several development opportunities for the AWP market. The demand for such machinery used for construction & maintenance operations is rapidly increasing from general infrastructure & industrial sectors. Due to enhanced safety & security parameters associated with access platforms, these machineries are deployed in huge numbers by small & big construction companies, contractors, and maintenance operators. Additionally, rising government investments across the globe for infrastructural development including roadways, railways, water, and electricity are contributing to access equipment market growth. Limited availability of trained operators and high costs involved in purchasing the equipment are hindering access equipment market growth. To overcome these issues and gain regional market shares, machinery providers are offering certified training & operation courses for workers. Such courses and training aid workers to efficiently operate machines and achieve higher safety levels. Additionally, the (mobile elevated work platform) MEWP market is also impacted by the increased sale of used equipment in various regions including Asia Pacific, Latin America, and Africa. This demand is due to the usage & import of old machines and the presence of price-conscious customers. The boom lifts segment was valued at USD 7.5 billion in 2018 owing to the demand from construction, mining, and maintenance applications in the aerial work platforms market. Due to the high platform heights and working radius, these lifts are deployed across major construction & maintenance operations of tall buildings and structures. Boom lifts are gaining huge traction in the rental & used equipment sector due to a high demand from the local & small contractors with fewer monetary resources. 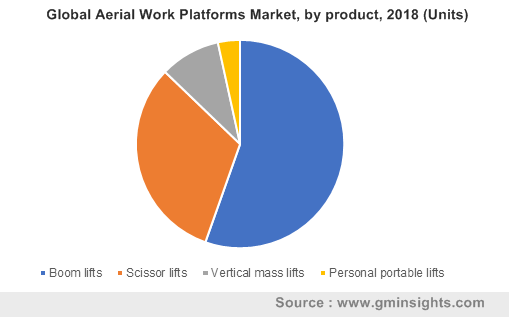 The huge demand from various application industries has compelled manufacturers to provide technically-equipped machines, such as electrification & hybridization technology, further adding up to aerial work platforms market growth. In the AWP market, electric lifts are expected to grow at a CAGR of 10% from 2019 to 2025. The high demand for electric work platforms is attributed to fuel-saving and low-emission capabilities associated with electric-powered machines. 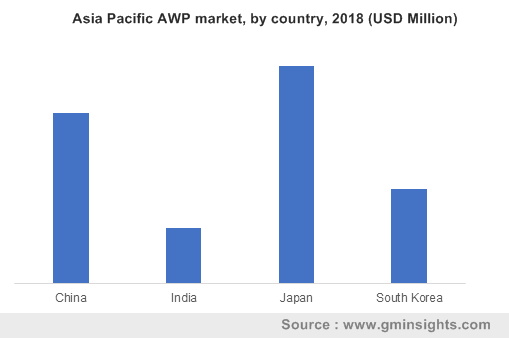 Several initiatives by the global construction industry, government organizations, and regulatory framework for reducing air pollution and carbon emissions from building construction activities are also impacting the MEWP market. As a result, several manufacturers are shifting toward providing electrically-powered platforms to address the demand from application sectors, further expanding the MEWP market. These platforms are also gaining a huge demand across rental applications due to the utilization of used & old machines in Asian countries including Malaysia, India, etc. In the aerial work platforms market, equipment with platform height 10 to 20 meters is expected to reach USD 9 billion by 2025, which is attributed to the increasing requirement for maintenance, glass-gazing, and cleaning work at commercial sites. Several companies have developed application & height-specific machines to address increasing customer demand. These platforms are easily transportable and require less installation time, providing time-saving advantages to operators. Due to increasing requirements in various applications, companies are developing safe and environment-friendly lifts & platforms that offer enhanced stability at heightened operations, further fueling access equipment market growth. The rental application segment was valued at USD 4 billion and is anticipated to witness growth due to a rapid increase in the demand for rented equipment across the globe. High initial & maintenance costs associated with new platforms are majorly compelling the customers to rent them. Another reason for renting AWPs is to reduce both time & cost related to transportation. These factors allow users to save machine procurement costs and invest in other essential activities. The increasing demand for such products supports the emergence of several rental providers across Asian countries including China, India, Brazil, Mexico, etc. 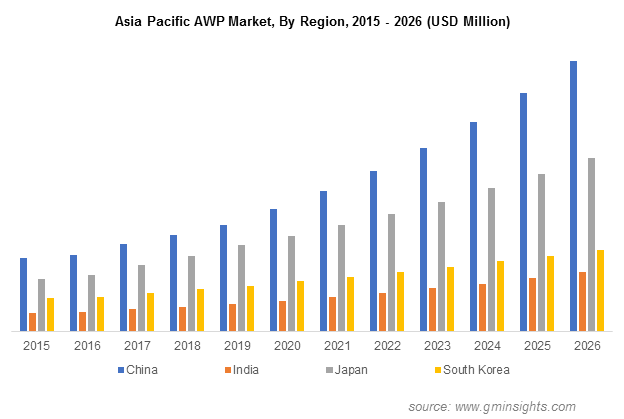 The Asia Pacific market is predicted to grow at a CAGR of around 12% from 2019 to 2025 due to the increasing awareness of price-conscious customers and government investments in India, Malaysia, and several other Asian countries. Moreover, these countries are also witnessing several construction activities in various industry verticals that require efficient platforms for performing high elevation work operations. Increasing worker accidents due to older equipment and most operations performed by human labors are compelling contractors to deploy access platforms to prevent loss of life & property. Additionally, the emergence of several rental companies in the region is a major reason for aerial work platforms market growth. Prominent players present in the access equipment market are JLG Industries, Inc., Terex Corporation, Skyjack, Haulotte, Aichi Corporation, Tadano, Altec, Manitou, Snorkel, and Niftylift. These companies are focusing on providing highly efficient access platforms to address the complex application requirements, majorly from the construction and energy sectors. Several manufacturers are developing electrically-powered MEWPs to support low fuel consumption & emission control initiatives adopted by governments in North America and Europe. Moreover, companies are also expanding their businesses to untapped regional markets to gain a major share in the global aerial work platforms market and spread awareness in smaller economies with less aware population. For instance, in November 2018, Zoomlion announced the launch of its new aerial work intelligent solutions in three different categories, electric, electro-hydraulic, and lithium battery-powered platforms. 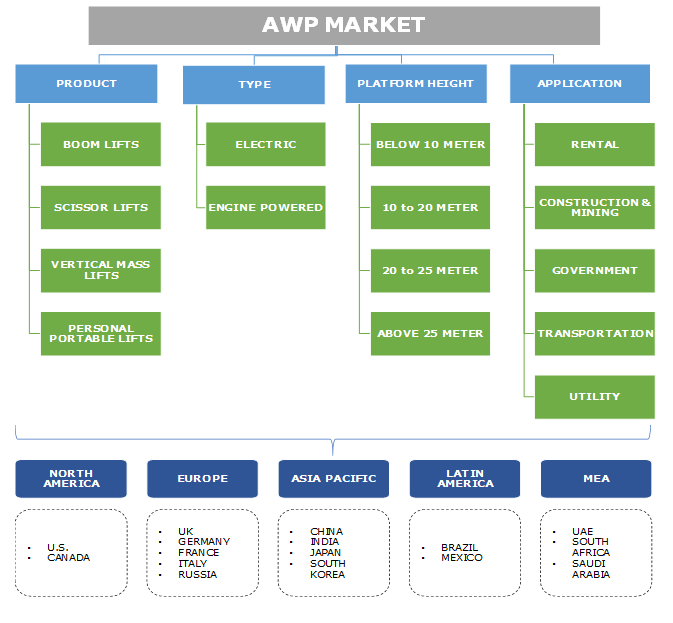 The AWP industry is characterized by high competition due to the presence of several established players across the globe. The aerial work platforms market is witnessing technical expansion due to the development of technically-equipped products, which facilitate safety and eco-friendliness. Due to an increasing need to conserve the environment and reduce harmful emissions from polluting construction & mining activities, industry players are offering electrically-powered platforms. Global expansion plans and catering to the demand from rental applications across rapidly-developing regions including Asia Pacific and the MEA have led major companies to launch their distribution facilities in these regions. This is done to provide easy & quick product delivery and efficient maintenance services, further supporting market growth.